The days seem to be getting longer and the walls around me are a bit smaller. This year has been long. It’s not over yet. Every morning I kiss my three man boys good bye and I turn and look at my dogs. We sort have this stand off and I have this looming lump in my throat hoping the hours while the kids are at school will pass quickly. The house will be too quiet and I will be alone again. This has been my routine for nearly a year now. Laundry, cleaning, dishes…pretty boring. I almost put up the Christmas tree last week. I thought that was pushing it. A year… I have learned so much about myself and my God in this last year. As God as become my constant listener and best friend, I have heard Him too. He loves me this much that He allowed epilepsy to rest on me. There is no answer to why. There is no answer to what will happen next. There is no real reason to fear, because God is always in control, and God always loves me. He will never, ever leave me. Don’t get me wrong, this disorder hurts, the isolation, fear of the next seizure, or straying too far from home all scare me, but with God’s help I try to overcome these things as much as possible. God is sovereign. Our whole family must rest in His sovereignty or we wouldn’t survive. How would my husband get through a workday without trusting God to care for me? How do either of us get through any day at all with our son on the road now without trusting God to watch over him? I venture out alone because I have to feel some independence. Is there some danger? Sure. Is God in control? Absolutely. Ultimately, in my deepest being I believe God is a kind and loving God and He wants me to depend on Him with all that I am. I think epilepsy is the only way I can do this…grrrr… So he loves me this much. He chose this for me. So my choice is to love Him back, trust Him, and depend on Him for whatever comes next. November is National Epilepsy Awareness Month. Honestly this last year has beat me down that I’m too exhausted to creatively and energetically spread the word. That frustrates me too. Johnny tells me I’m too hard on myself, but 1 in 26 have this and 60,000 in the US will die from Sudden Unexpected Death in Epilepsy, so this still needs a voice. Locally, Mayor Swain signed a Proclamation declaring November as Epilepsy Awareness Month in the Town of Huntersville. My son is having the annual Purple Day at Huntersville Elementary on Nov 14 and Mayor Swain is even stopping by to visit the classrooms and help spread awareness that day. Would you wear purple on Nov 14 to support Hunter’s Purple Day too? Our family is in purple everyday this month, but for one day, that would be pretty cool. 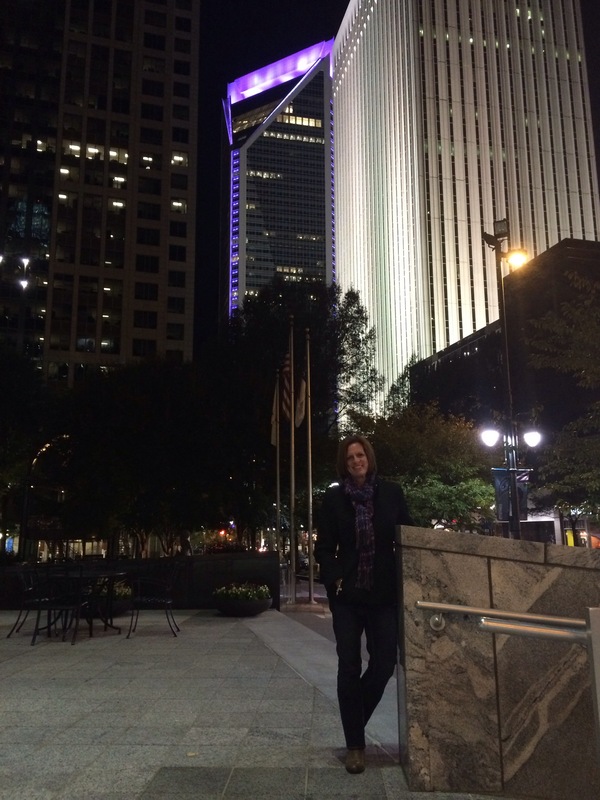 Johnny and I were in Charlotte Sunday night to see the Duke Energy building shining purple over Charlotte. More people are talking, less people are whispering, more research is being done, and maybe one day we will have a cure. Until then, I rest in the peaceful knowledge that God loves me this much, He didn’t give me this and then forget me. This entry was posted in Advocacy, Epilepsy, Epilepsy Awareness, Faith and tagged Epilepsy Awareness Month, Faith, Huntersville, Purple Day. My dear wife, My love for you is endless and boundless. It is unchanging and unconditional. It knows no limit and cannot be diminished . Yet my love withers and fails compared to His love for you. It brings me such joy to know that you know how much He loves you.